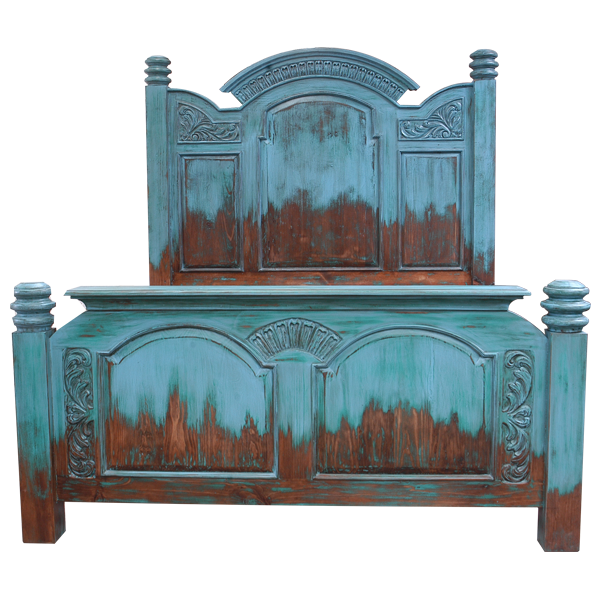 This luxurious, handcrafted, Western style bed is called “Agua” because of its gorgeous, distressed, turquoise finish. 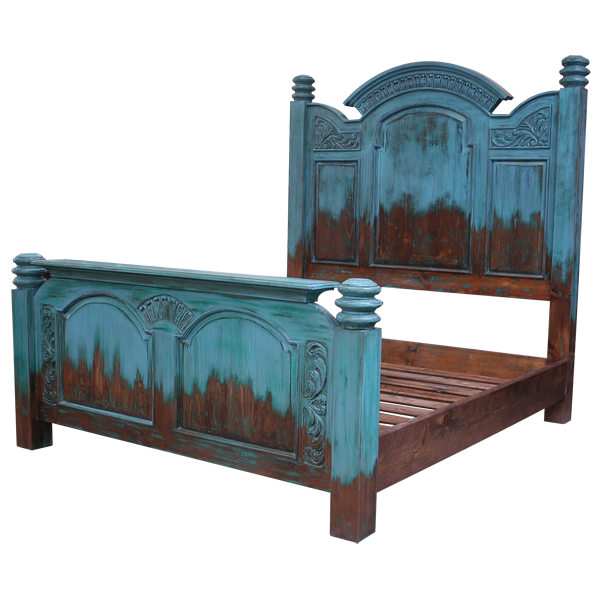 The bed has a solid wood headboard with a marvelous, centered, curved, top crest. Below the crest are ornate, hand carved, geometric designs. The front of the headboard is adorned with three, geometric cut panels, and the large, center panel has an arched top. Each top corner of the headboard is embellished with exquisite, hand carved, floral and scroll designs. The headboard is framed with solid wood uprights, and each upright is accented with a hand turned design on its top. The bed has a rectangular footboard, and the footboard has a staggered, top molding. Below the top molding are two, geometric cut panels, each with an arched top. The panels are divided by a center, solid wood upright, and above the upright are elegant, hand carved designs. On each side of each geometric panel are beautiful, hand carved, floral and scroll designs. 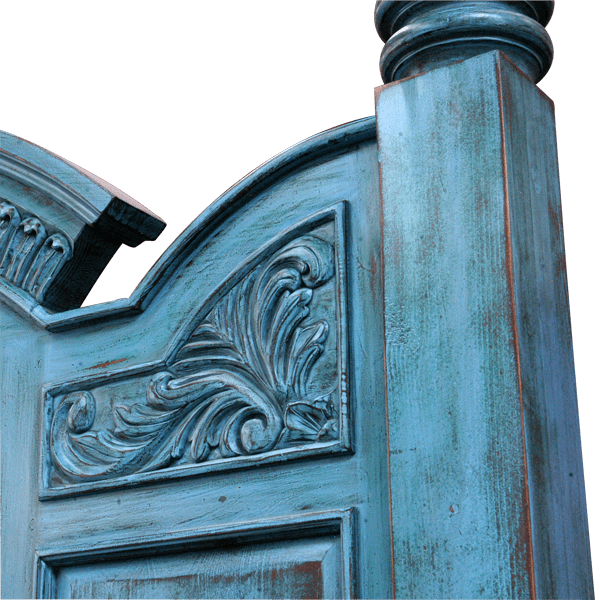 The footboard is framed with solid wood uprights, and each side upright is garnished with a hand turned design on its top. 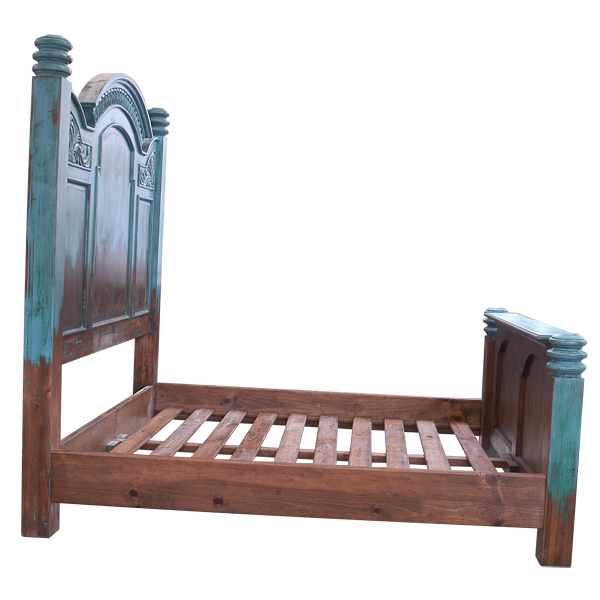 The bed rest on square cut legs, and it has solid wood, side rails. It is made with the best, sustainable, solid wood available, and it is 100% customizable.